Ugly on the outside and beautiful on the inside: it’s salsify! Its fine, white flesh has nutty tones and is nice and spicy – it’s really delicious – that’s the good news. The fly in the ointment is the preparation – that’s a bit of an arduous task. It’s worth it. You simply can’t top the final product – steamed, fried or baked salsify. And this is how I’ll do it: don’t buy specimens that are too thin (a lot of material is removed while peeling) - only tap the dirt off of the sticks, don’t wash them (the dirt sticks to the salsify when it comes in contact with water) - definitely wear rubber gloves and an apron (I once forgot, and attained eternally brown-stained fingers thanks to the white, sticky juice) – now be brave and peel the salsify with a solid potato peeler. Marinate the delicious white sticks in lemon or vinegar water to avoid discolouration. .... Since salsify is in season between October and April, it’s a really good winter alternative to asparagus. It’s nickname, “poor-man’s asparagus”, really doesn’t fit nowadays. 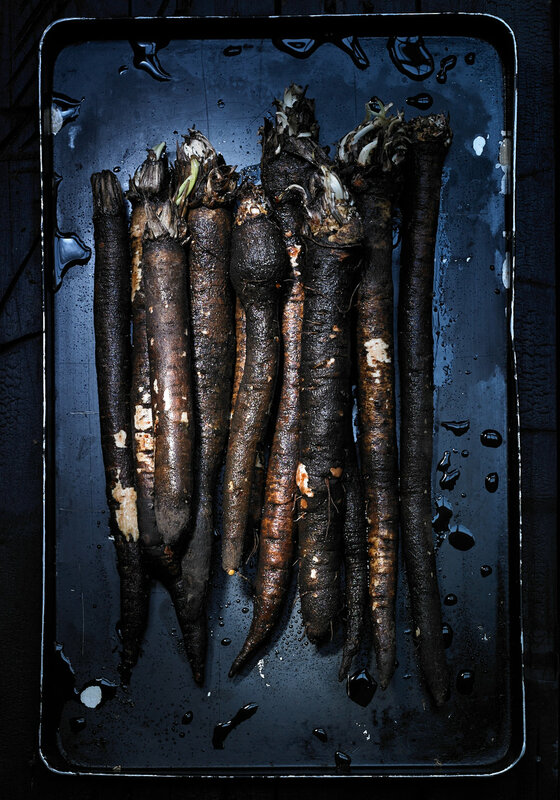 Salsify is indeed more expensive than carrots. Doesn’t matter. What’s important is that it not only tastes good when cooked in a variety of different ways, but it’s made really healthy through the vitamins and minerals it’s packing. In it’s native Spain, it was used to treat snake bites and the black plague. Ever since 1700 it’s been cultivated as a vegetable – they must’ve not known what was under that gnarly skin. Übrigens nennt man die Schwarzwurzel – ihre Saison geht von Oktober bis April – auch »Winterspargel«. Ihr zweiter Spitzname »Arme-Leute-Spargel« passt heute definitiv nicht mehr. Immerhin sind Schwarzwurzeln teurer als Karotten. Egal. Wichtig ist, dass sie nicht nur auf vielerlei Arten (s. o.) echt gut schmecken, sondern auch durch die enthaltenen Vitamine und Mineralien sehr gesund sind. In ihrer Heimat Spanien galten die Wurzeln früher als Heilmittel gegen Schlangenbisse und die Pest. Seit 1700 werden sie als Gemüse angebaut – vorher hatte wohl niemand gewusst, was unter ihrer krumpeligen Schale steckt. 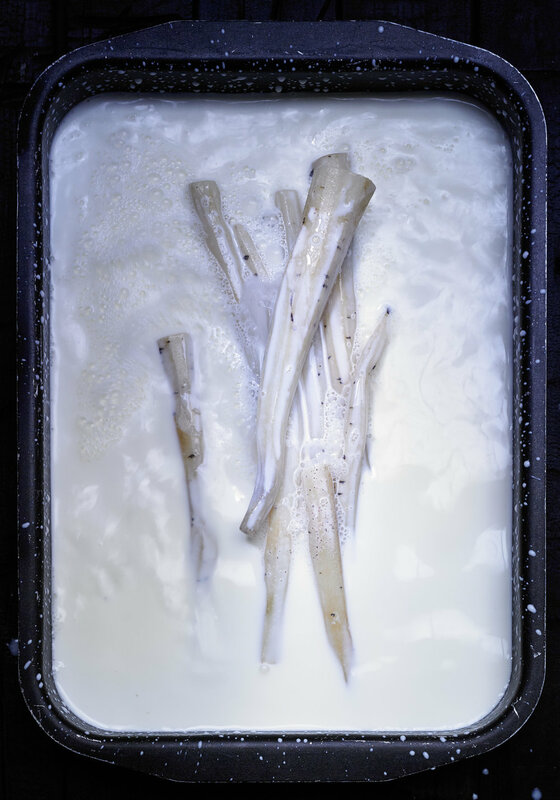 Wash, clean and peel the salsify and soak in a milk and potato whitener mixture (so that they don’t brown). Boil in salt water for around 10 minutes. Rinse under cold water, sear in olive oil and add thyme. Place the tart dough into a baking dish and use a fork to prick the bottom. place the salsify on the dough. Whisk the eggs with the cream, add salt and pepper to taste, and pour everything over the salsify. Bake for 40-50 minutes at 175 degrees. Wash and halve the pomegranates. Place one half aside (the seeds will be used for the dressing). Squeeze the rest of the pomegranates into juice. Mix the juice with mustard, salt and pepper in a bowl. Add the rapeseed oil bit by bit while whisking into the mixture. Add more salt and pepper to taste and add the pomegranate seeds to the dressing. Rinse, clean and dry the purslane and the leafy salad. Roast the pine seeds. Drizzle the pomegranate dressing over the salad, top with pine seeds and serve with the salsify tart. Die Schwarzwurzeln waschen, putzen, schälen und in Milch mit Haco Weiß legen (damit sie nicht braun werden). Dann im kochenden Salzwasser für ca. 10 Min. kochen. Kalt abspülen und in Olivenöl scharf anbraten, Thymian zugeben. Den Tarteteig in die gewünschte Form legen, mit einer Gabel den Boden mehrmals einstechen und die Schwarzwurzeln auf dem Teig verteilen. Dann die Eier mit der Sahne verquirlen, mit Salz und Pfeffer würzen und alles über die Schwarzwurzeln geben. Bei 175° C ca. 40–50 Min. backen. Die Granatäpfel waschen und halbieren. Einen halben Granatapfel beiseitelegen (wegen der Kerne für das Dressing). Restliche Granatäpfel zu Saft pressen. Den Saft mit Senf, Salz und Pfeffer in eine Schüssel geben. In einem dünnen Strahl das Rapsöl zufügen und dabei mit dem Schneebesen emulgieren. Nochmals mit Salz und Pfeffer abschmecken und die Granatapfelkerne zugeben. Portulak und Blattsalate putzen, waschen und trocknen. Pinienkerne rösten. Den Salat mit dem Granatapfel-Dressing anmachen, Pinienkerne zugeben und mit der Schwarzwurzel-Tarte servieren.